It is with great pleasure that the Minuteman Road Club announces our official road race team sponsors for the 2016 season. Returning are the support of Landry’s Bicycles, Rudy Project, and Verge Sport. We are proud to announce our new road race team title sponsor Wachusett Brewing Company. 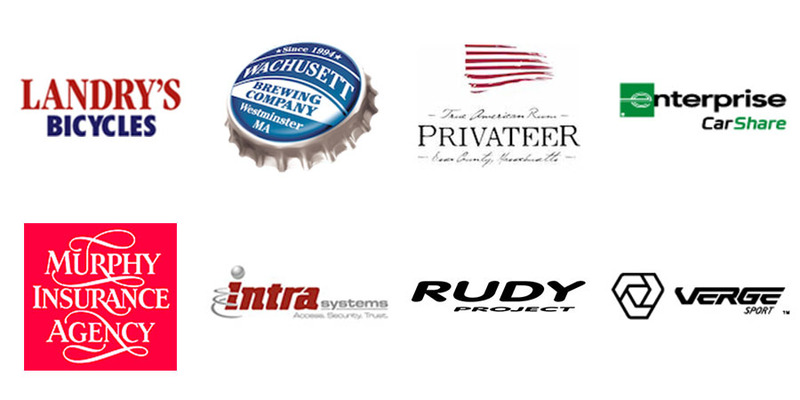 Also supporting the Minuteman Road Club are Privateer Rum, Enterprise CarShare, Murphy’s Insurance, and Intra Systems. Landry’s Bicycles – Full service bike shops in Boston, Norwood, Natick and Westborough. Everything the beginner or the pro would need, professional bike fitters, sales and service. The MRC’s oldest and most stalwart sponsor! Freedom. Innovation. Conviction. It’s in our DNA. It’s in our rum. Enterprise CarShare – Enterprise CarShare is an automated way to rent a vehicle by the hour, the day, or overnight. A variety of makes and models are parked in your community – where you live, and where you work – and are accessible 24/7. Murphy Insurance Agency – Murphy Insurance Agency is among the largest independent agents in Massachusetts with locations in Bolton, Groton, Harvard, Hudson, Marlborough, Medway and Mendon. We represent 29 companies and have access to many more. Where you purchase your insurance makes a difference. Murphy Insurance offers you one reliable relationship for safeguarding your financial stability – whether your needs are personal, business or both. IntraSystems – IntraSystems empowers companies to deliver secure, on-demand access….anytime, anywhere. As a Citrix Platinum Solution Partner, our certified engineers design, deploy, implement, and maintain complex IT infrastructures throughout the U.S. Our mission is to provide secure application delivery, virtualization services, and secure network infrastructure solutions centered on the principles of excellence, service, and quality. Rudy Project – Sunglasses, helmets, goggles and other gear. Rudy Project works in cooperation with athletes from all fields, listening to what they want and need – they never stop researching to find the latest and best materials available to realize cutting-edge products. Verge Sport – The inspiration behind Verge Sport came from the clothing needs of an elite athlete. Racing in the European road cycling circuit throughout the early 1990s it became obvious to Michael Magur that the custom technical apparel needs of athletes were outpacing what was being delivered — the wheels turned and Verge Sport was born in 1996. Since those first orders on through to today, customer satisfaction has been at our core. Our goal is for you to be happy with not only the final product, but the entire ordering and communication process involved in bringing your design to life. We look forward to another amazing season and want to thank all our sponsors for believing in us.